Hormonal changes during menopause affect every part of your body, even your mouth. There are several menopause symptoms related to oral health, including burning mouth syndrome and gum disease. While you may not be able to reverse the clock and restore your hormone levels, there are simple changes you can make to restore your gum health. 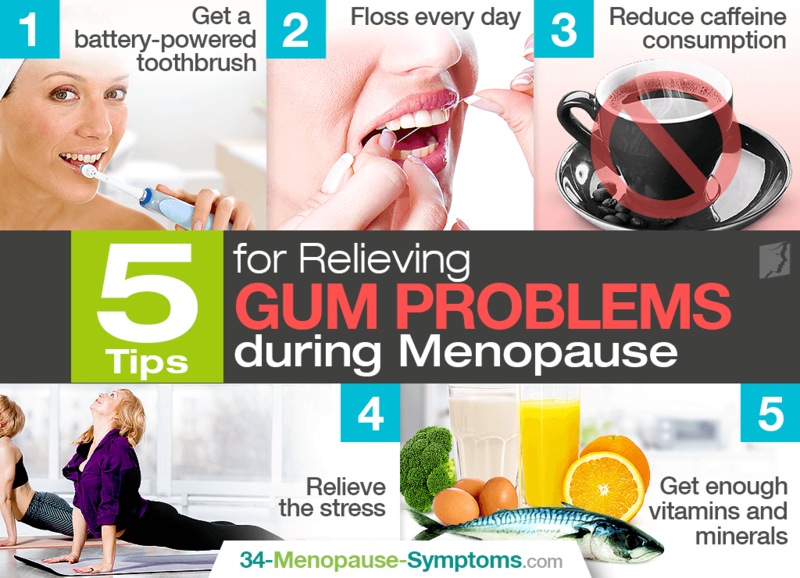 Gum disease during menopause is often caused by dramatic changes in estrogen levels in your body. Estrogen maintains several areas of the mouth, including the tongue, salivary glands and jawbones. Gum disease often starts to set in at the same time as osteoporosis, which can affect the teeth as well as other bones in your body. Another menopausal symptom is dry mouth, caused by a decrease in saliva due to lower estrogen levels. Lack of saliva weakens your first line of defense against developing gingivitis because saliva contains oxygen, which helps rid the mouth of bacteria. Coupled with weaker oral tissue from estrogen deficiency, your mouth becomes a prime target for bacteria to fester and develop gingivitis. Gum disease is characterized by dry or swollen gums that change color and bleed when you brush your teeth. Below are five everyday tips to help you fight gum disease. During menopause, a vibrating toothbrush is more than a luxury; it's a necessity. A study conducted in the Netherlands concluded that these toothbrushes stop the development of gingivitis, a precursor to more serious gum disease. Flossing can reach between teeth to pull out plaque and tartar that a toothbrush can miss. Aside from staining your teeth, it can also worsen estrogen imbalances in your body, increasing severity and frequency in menopause symptoms. Additionally, most caffeine is consumed with large amounts of sugar, which rots your already fragile teeth. Physical changes caused by stress increase the production of plaque along the gum line. You can control this buildup of plaque by relaxing with exercises such as yoga and meditation. Nutritional deficiencies from poor diet choices can contribute to gum deterioration. Make sure to get enough vitamin C to boost tissue and bone renewal and plenty of vitamin D, which reduces inflammation of the gums. Visit the dentist every six months for a teeth cleaning and check up. Click the following link to read more about treatments for gum problems.